Committed to the Considerate constructors Sceheme. Minimal disruption has been caused on a building site in Billinghay thanks to considerate constructors Robert Woodhead Ltd.
North Kesteven District Council has been working in partnership with Robert Woodhead Ltd and the local communities to ensurethere is no significant disturbance during the works on The Whyche in Billinghay. Project Co-ordinator, Alistair Taylor said “Robert Woodhead Ltd is always looking at ways to continually improve and go that extra mile to satisfy and exceed all the criteria for the Considerate Constructors Scheme. We have taken a companywide commitment to the Considerate Constructors Scheme and regularly appraise our operating standards in line with the scheme to achieve continuous improvement”. Poor weather mixed with the existing clay soil whilst excavating for the foundations meant the site conditions were at times very messy. This can often be transported onto the adjacent public roads as construction traffic moves on and off the site. As Considerate Constructor’s Robert Woodhead Ltd have gone to great lengths not to let site mess spread onto the paths, roads and surrounding areas, putting the neighbours and other road users at risk. Site Manager, Eddie Lucas and the team working on The Whyche, Billinghay are continuing to work hard to keep the roads clean and safe for all concerned. “I would like to take this opportunity to thank Eddie and the team for all their efforts to keep the area clean and it is great to get recognition from both the neighbours and North Kesteven District Council for our effort which so often gets overlooked” said Alistair. 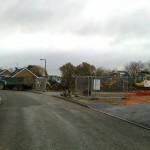 Councillor Stewart Ogden, executive member with responsibility for housing management said: “The contractors have shown how important site care and its surroundings are to them during construction. 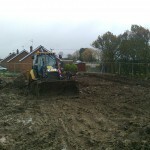 The district council appreciates how hard they have worked to maintain a clean site and thank them for their effort”.